I ended up staying in Chapel Hill, and when I read up on the whole area and looked into donation opportunities, 2 places jumped out at me. 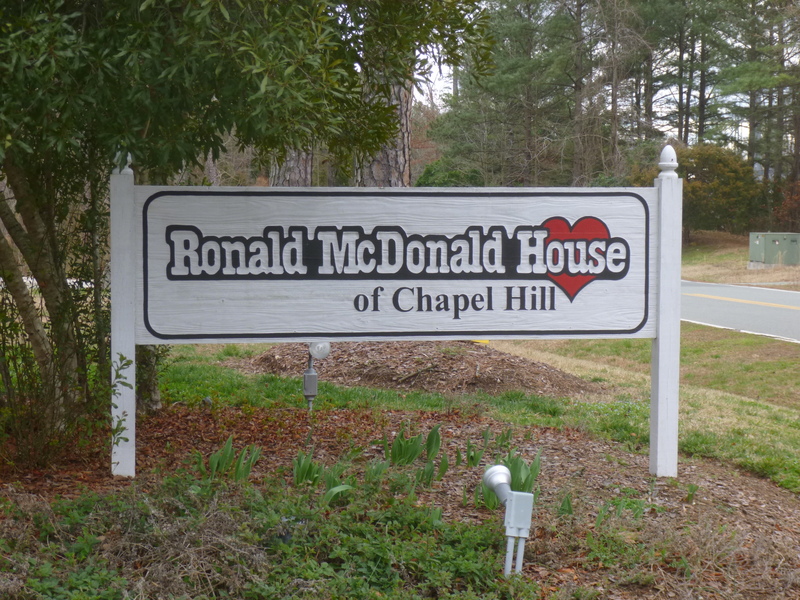 The first one was The Ronald McDonald House because it was only a few miles away from where I was staying, and the Chapel Hill area seems to have a lot of medical facilities. 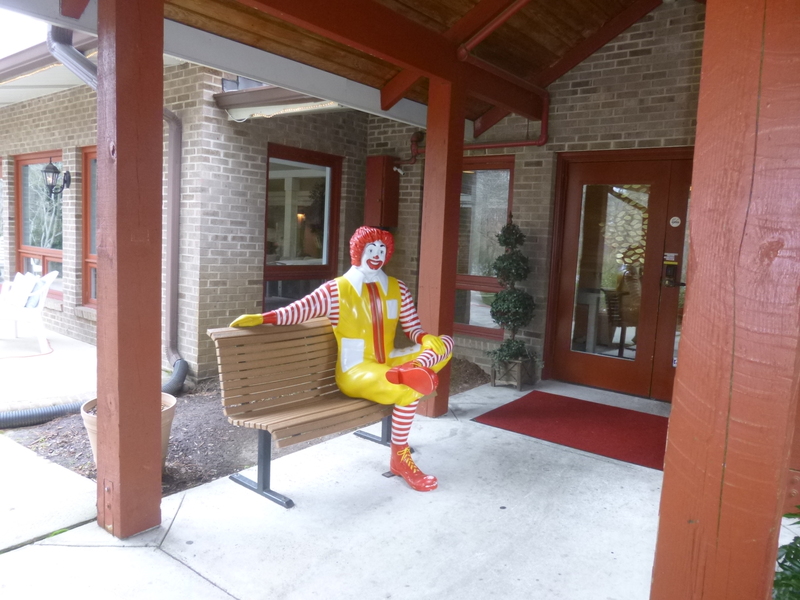 This Ronald McDonald House has been providing a home away from home for families of critically ill children for 25 years. When I called to see what kind of donation might be most helpful, they said a financial donation would be best, so I drove over to drop off a check. 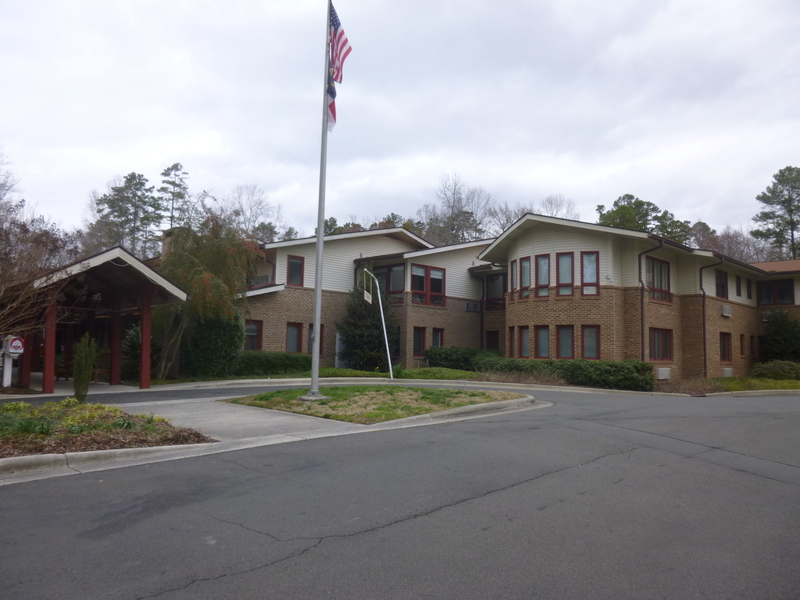 The office area was very nice, and they’ve certainly been able to provide comfort for many families over the years. As I was driving to the Ronald McDonald House, I saw a bike trail in a pretty area, so after I made the donation, we got out and walked the first 4 miles for today. Then I wanted to head back to Raleigh, the City of Oaks, for 2 reasons. 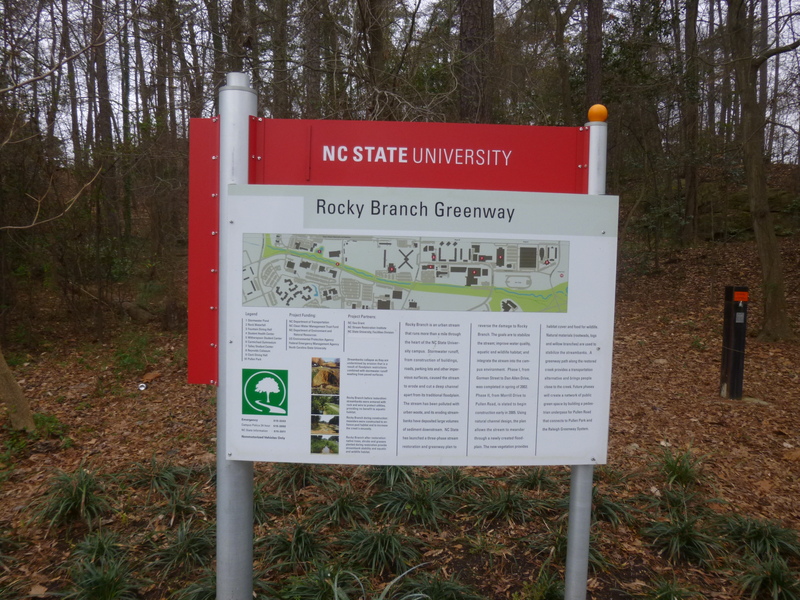 I had read that back in 1974, the year I graduated from high school, Raleigh started building its extensive system of recreational trails to help preserve some natural space in and around the city despite its growth and urbanization. Because of that, in 1975, Raleigh was named the first “Green Survival City”, so I wanted to go walk some miles on one of the greenways. 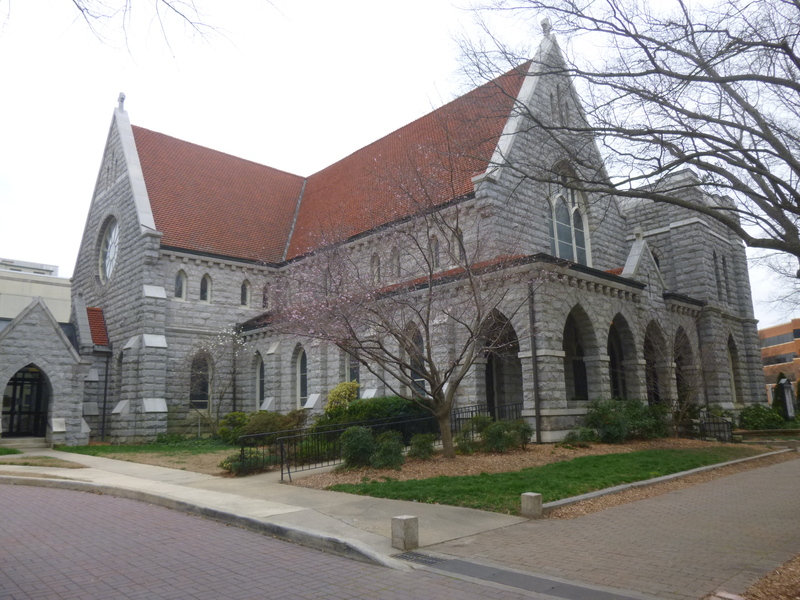 I had also read about a big soup kitchen in Raleigh called the Shepherd’s Table that sounded interesting, and it was only a block away from where I had parked yesterday, but I hadn’t walked down that particular street, so I hadn’t noticed it. 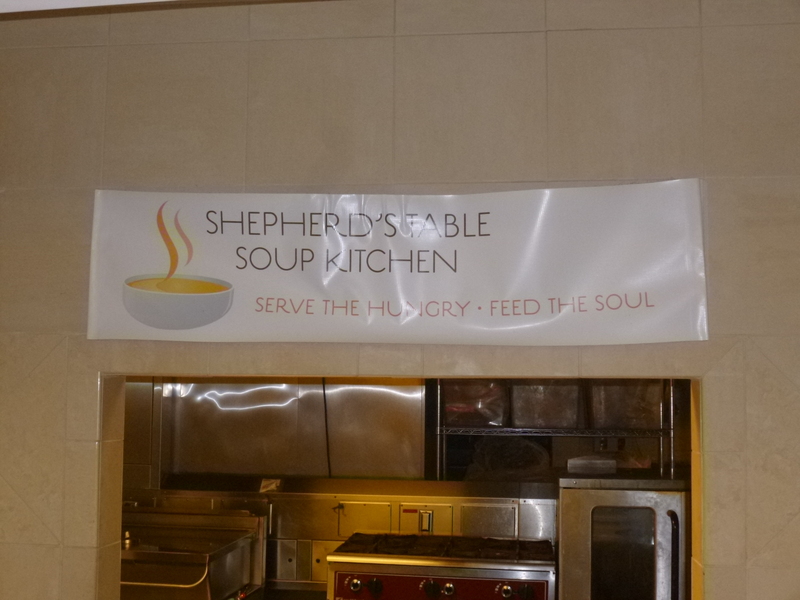 So I returned to Raleigh and found the Church of the Good Shepherd, where the soup kitchen was, and there I met the associate director Ashley, and she showed me all around and told me about the program. They have a wonderful, huge space in the basement of the church that was built specifically for the soup kitchen. The volunteers provide lunch to anyone who comes through the doors 5 days a week, no questions asked, and they average about 300 people a day. Since they are not federally or state funded, they don’t have to worry about what communities the people come from or any other details – they just feed everyone. About 50% of the people are repeat guests (some have been coming for years), and many others come and go. About 80% of the guests are male, and usually everything goes fine, but they do have an off-duty police officer who comes during lunch just to keep an eye on things, and to be available during the rare times that someone might be looking for trouble. 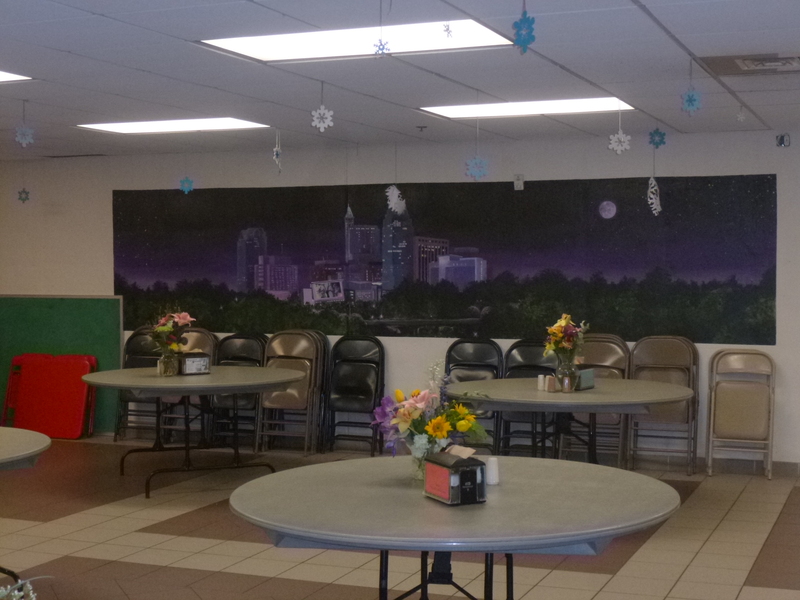 In addition to the regular food donations that they get, they send out a “food rescue” truck to area restaurants, and stores like Trader Joe’s and Costco also are generous with donations – in fact, Trader Joe’s supplies fresh flowers every Tuesday, so those are placed on all the tables to help provide a welcoming environment. 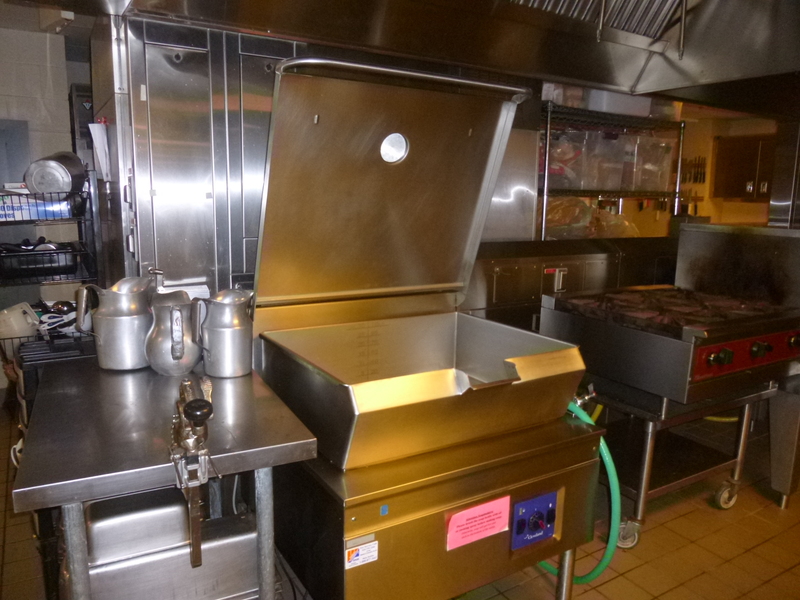 The kitchen is very spacious and Ashley showed me the biggest soup kettle I’ve ever seen – they often make 18 gallons at a time. They do not plan their menus because they don’t know in advance what food will arrive, and they have a large volunteer staff – the “Monday Group”, the “Tuesday Group” etc. I really enjoyed seeing everything and hearing about the program. It’s big and organized and it’s a really nice environment. Lunch time is probably the nicest part of the day for many of the people who show up. 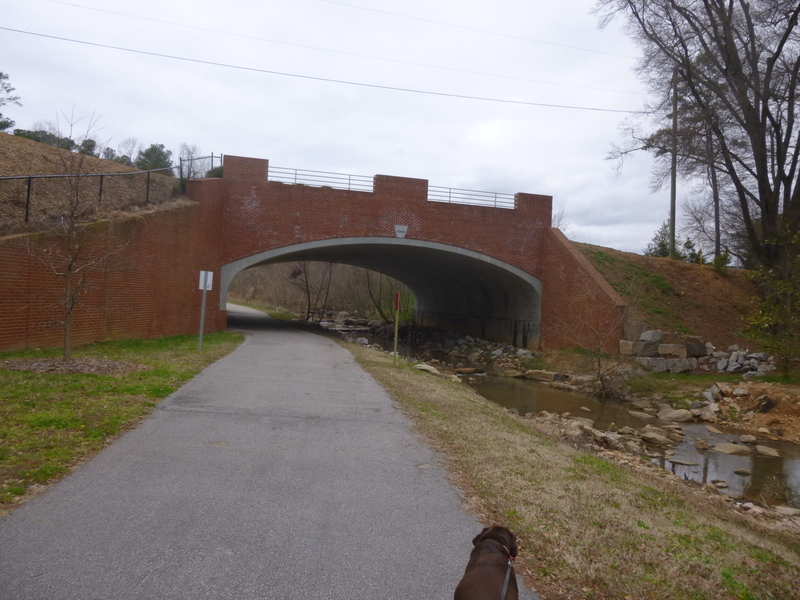 Then Tula and I went out and walked 6 miles on the nearby Rocky Creek Greenway, part of which took us through the heart of the North Carolina State University campus. There were environmental signs along the way, with information that urban creeks and streams can be some of the most difficult to clean up. And, despite all the effort, there was still quite a bit of litter in the water – it’s too bad so many people are careless with their garbage. By this time it was getting dark, and I headed back to Chapel Hill. Snow seems to be in the forecast for the West Virginia mountains both this weekend and mid-week next week, so I had some thinking to do about my itinerary!